As with lots of my classical posts, I will type up a portion of the liner notes, because they describe the music better than I can. I like this a lot. That's about as good as I get. Schnittke' s Concerto No. 1 for Violin and Orchestra (1957, revised 1963) is rich in ideas and explores a wide range of emotions. Great inventiveness is shown in the treatment of the solo instrument, but the composer's attention is centered not on the virtuoso aspect but on violin cantilena. The wealth and unique beauty of its melodies are among the most attractive qualities of the concerto. The principal subject of the first movement (in sonata form) begins with a flowing melody from the solo violin. The unusually complicated melodic outlines of the principal theme in combination with the complex rhythmic pattern suggest concentrated searchings, painful deliberation. The initial motives from this theme become interwoven with almost all the themes in the other movements, playing røle of leading motives. The subsidiary subject of the first movement, with a characteristic augmented second, also acquires an important place in the dramatic development. The second movement is a rushing scherzo based on the alternation and development of three themes, all of which are related to one other. They are unified by a poignant nervous rhythm, angular melodic contours and "sharp" bowing. The concerto's leading motive is easily distinguished in the melody of the first theme. The third movement opens with a tranquil and songful themes, also containing the leading motive. The middle section, wholly based on thematic material from the first movement, comes as a startling contrast to the calm and lucid song. After the statement of an agitated - yet flowing - theme by the solo instrument (this theme is close to the subsidiary theme for the first movement), contrapuntal development begins in the orchestra. This episode, where the evenly-paced counter-subject recalls the outlines of the leading motive, leads to a tensely dramatic climax. The leading motive undergoes transformation in the resolute and resilient principal subject on the fourth movement (in sonata form); its melodic outlines become simpler and more definite, its rhythm clear-cut and precise. The Finale's playful and whimsical second theme resembles the subsidiary theme of the first movement. The closeness of the two themes becomes still more apparent when, after the statement of this second theme, the subsidiary subject from the first movement itself makes and appearance. A brief development section is followed by a recapitulation and an extended concluding section which presents, one after another, the two themes from the first movement and the themes of the Finale in reverse order. The concerto was first performed over the air on 26th November 1963 by Mark Lubotsky and the Moscow Radio Symphony Orchestra under the baton of Gennady Rozhdestvensky. In autumn 1956, while still a student at the Moscow Conservatory, I began this violin concerto. I called it my Opus 1 - the last opus number I have hitherto assigned. The concerto was not reworked until 1963, and then to an apparent continuation with the quite different Violin Sonata No. 1 - but everything written until then was wrong, and has remained so. The solo violin begins with a broad rhythmically expressive cadenza in which a central function, akin to that of a pedal point, is assigned to the note G.
At the sound of a bell a string cluster joins in, and immediately afterwards brief sound structures from the wind, piano or percussion interrupt the separate solo violin episodes. The solo violin starts a new espressivo, and like shadows the accompanying violins follow (with different bowing techniques); gradually they resolve themselves towards ever stronger independence. The thickening string sonority is ordered and driven on y impulses from the percussion (bongos and tom-tom). Then, however, the strings, which had been splayed out into total dodecaphony, unite with the soloist for a unison passage overlaid by the percussion. A double bass solo (against piano glissandi and comments from the percussion) leads to a long improvisation from all the accompanying instruments. This is followed by a very delicate sequence of non vibrato chords from the strings, with which the virtuosic soloist joins in. A further improvisatorial section from the orchestra is followed by a surprising change of scene: a brief solo cadenza introduces an episode rather like a slow foxtrot, played by the soloist accompanies by piano and percussion. Once more the solo violin reaches the fundamental note G; as if in a reprise we hear the wind entries from the opening. A bell marks the soloist's last interlude, followed by a percussion intermezzo; then string clusters lead to the final phase of the piece. In steady rhythm, the solo instrument reaches out from his "note of departure" to fixed intervals. From individual glissando and pizzicato comments from the strings there gradually proceeds an orchestral climax of which the timpani take over the soloist's hammering motif. After this outburts, the soloist continues this motivic work - which is inexorable with its motoric drive - until, above gentle clusters from the strings and wind, the ostinato note G slips away into its opposite pole, F sharp, which had been expected throughout the piece. The Concerto No. 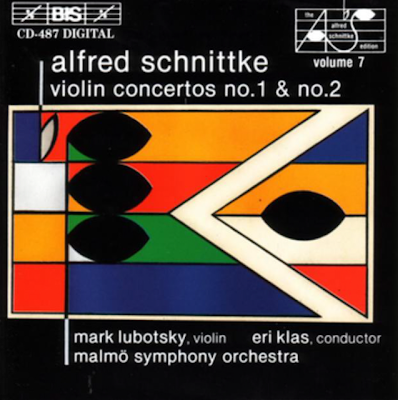 2 for Violin and Chamber Orchestra was written in 1966 at the behest of Mark Lubotsky, who also gave the first performanec on the occasion of the Jyvaskyla Festival in Finaland that year, conducted by Friedrich Cerha. The concept which lies behind the work comes from a certain drama of tone colours: the soloist and the strings are treated in a linear, thematic manner whilst the wind and percussion are aggressively punctual and aleatoric. The double bass has the special role of a caricatured "anti-soloist". The sequence of several contrasting episodes shows clear signs of traditional formal structures: solo cadenza at the outset, exposition of the two sound spheres, Adagio episode, development climax, recapitulation, coda-finale. A chromatic twelve-tone row serves as the thematic foundation, but there is nevertheless a center of melodic gravity, the constantly returning note G, which sometimes leads to an illusion of tonality, especially at the beginning and the end of the work.